2. Using a mixer, beat butter until creamy. Add sugar and beat until light and fluffy. Add egg and vanilla and blend well. 3. In separate bowl, whisk the red food coloring into the buttermilk. 4. Alternately blend flour mixture, then buttermilk mixture into butter mixture, beginning and ending with flour mixture. 5. Combine the vinegar and baking soda in a small bowl and allow to fizz. Fold into the cake batter. 7. Bake 4 to 5 minutes or until a toothpick inserted into a cake pop comes out clean. Tip: If you don’t have buttermilk on hand, pour 1½ teaspoons lemon juice or vinegar into a glass measuring cup. Add milk to equal ½ cup. Allow to stand 5 to 10 minutes, then use in place of buttermilk in this recipe. When you want to spoon the mixture into the reservoir, place it in a disposable piping bag. Cut the tip off (very small opening) and now pour into the reservoir. Once done with one batch, close it up the opening with a bag clip because the cake mixture is very thin and runny. I also used a big bag clip at the top end, to ensure no spillage. I used chocolate melts and placed it in a glass bowl on a double boiler. Melt the chocolate and if not runny enough, add some olive oil (small amounts at a time) and mix until you reach the desired consistency. Place pops in the freezer, till very cold or even a bit frozen. 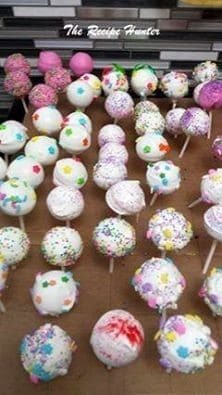 Take the pop stick, dip it in the chocolate mixture and insert into the bottom of a cake pop, otherwise the stick will not stay put. Place back in the freezer. Once all pops have a pop stick, start over again and swirl the pop by holding onto the stick in the chocolate and cover completely. As its frozen (or very cold at least) the chocolate will set on the pop although the outer layer will still be soft and sticky. Now decorate as desired. We had a double layered cardboard box and drilled holes into it to place the still wet pops on to dry. Once completely dry, pack into small bags (if you’re lucky enough) to have any left and not eaten. We made 3 recipes and eventually had ±120 pops and all had a feast.